Ever since a cosmic phone call led to five literal young goddesses Belldandy, Urd, Skuld - and, like occasional vowels, Peorth and Lind - to live in college student Keiichi's residence, his personal life has been turned upside down, sideways, and sometimes even into strange dimensions! 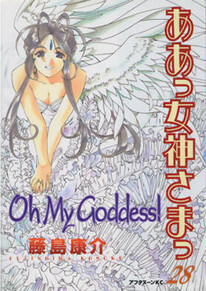 After the drama of the familiar, we return to the comedy of the even more familiar, as Oh My Goddess! goes back to school - Nekomi Tech, that is, only to find the campus festival tradition has lost none of its lunacy. Tamiya and Otaki are bringing all their idol graces to the stage in a karaoke contest, with a special surprise entrant from way back... versus the indescribable voice of Belldandy!